Understanding the desperation of the people who are fleeing violence and corruption in Central America is an essential part of the puzzle. U.S. officials have also made asylum requests more difficult, and now Tijuana is caught in the middle. Tension has long been building between Central American migrants — desperate to get to the United States to escape poverty and violence — and the U.S. government, which has been making it increasingly difficult for them to come. The tension has been compounded by frustration in Tijuana, where residents have found themselves caught in the middle. The tension culminated Sunday in a march gone awry: U.S. border agents sent tear gas into Mexico and officials shut down the San Ysidro Port of Entry for roughly five hours on a holiday weekend. Hundreds of individuals staying in the Unidad Deportiva Benito Juárez, a sports facility that has been turned into a make-shift shelter for the thousands of Central American migrants in recent weeks, marched toward El Chaparral, the Tijuana-side of the San Ysidro PedWest crossing. El Chaparral is where asylum seekers turn themselves in to U.S. authorities to request asylum. The march was supposed to bring attention to the plight of the people who had traveled through Mexico since October to reach Tijuana, and were now in the overcrowded sports complex. Many participants wanted to send a message that they’re not criminals, as President Donald Trump has labeled them, and that they had the right to request asylum. Before reaching the port of entry, though, they reached a blockade of Mexican federal police at the foot of the bridge that went over the Tijuana River — which is more of a sewage-filled canal in that area these days — and led to El Chaparral. After a standstill at the bridge, some in the group ran around the federal police blockade. VOSD’s Adriana Heldiz captured video of the moment many demonstrators ran across the canal and then toward the fencing on the U.S. side and El Chaparral. Mexican officials then barricaded the port of entry, trying to control the group of migrants, while Border Patrol agents launched tear gas near one section of the fence on the Mexican side. Border Patrol later argued that projectiles had come from the Mexican side of the border. Agents have long bemoaned rock assaults or “rocking” as a problem. Several weeks ago, Trump suggested that lethal force would be an appropriate response to the rocks, though he later walked back the comments. In Arizona last week, a Border Patrol agent who fired into Mexico and killed a teenager was found not guilty of involuntary manslaughter. The agent argued that the teenager had first thrown rocks. Several people were arrested on the U.S. side after crossing during the conflict Sunday. By Monday morning, the Associated Press put that number at 69. To understand how tensions built to Sunday’s events, here’s a short video. Let’s also take a step back and consider not just the past couple weeks, but the context that stretches years. You’re reading the Border Report, Voice of San Diego’s bi-weekly round-up of news from the San Diego-Tijuana region. You can subscribe here. Understanding the desperation of the people who are coming from Central America is an essential part of the puzzle. The push and pull factors leading people from this region to leave their countries and come to the United States is something I’ve written about in past Border Reports and in this explainer about migrant caravans. Honduras, where most people in this exodus come from, has not only faced the poverty, gang violence and gender-based violence that plagues the region, but also problems with the current presidential administration. Last year, Honduran President Juan Orlando Hernández Alvarado won re-election by a narrow margin that has been widely criticized as fraudulent. A number of people have been killed in post-election protests by government security forces with no justice in sight, reports The Guardian. The United States supports the disputed leader. Reporting in the past couple of weeks from the Miami Herald reveals the extent of problems with the current Honduran administration. The president’s brother was detained in Miami last week for “conspiring to import cocaine into the United States, and related weapons charges.” The Herald also reported that political violence, which has partly caused the recent exodus of Hondurans from the country, was sometimes carried out with U.S.-made weapons used by the government’s paramilitary force. Univision also dug into the low pay and safety risks of working in the banana industry in Honduras, which as a result of U.S. demand is one of the biggest employers in the country, and helps explain some of the economic conditions there. The Trump administration has long made clear that it thinks asylum is a loophole for Central Americans. It’s been trying to make requesting and obtaining asylum more difficult, particularly for Central Americans, who rarely win their asylum cases as it is. The most drastic of measures was the so-called asylum ban, which would have people who crossed between ports of entries ineligible for asylum. The move was blocked by a federal judge last week. But two of the most significant factors are the slow processing and the alleged discouraging of asylum requests, both of which allow migrants to bottleneck in Mexican communities along the border, like Tijuana. Customs and Border Protection has said it can take up to 100 people per day to be processed for asylum at the San Ysidro Port of Entry, but advocates at the border say it’s often fewer than that, sometimes as low as 20 people. As thousands of asylum-seekers come to Tijuana to turn themselves in at the port of entry, that means waiting for months. The problem has been building for a while, but it was exacerbated under the Trump administration. Several organizations have sued the government for its practice of turning asylum seekers away from the port of entry. The original complaint was filed in 2017, challenging practices in 2016 and has since been amended. Last week, new documents filed in the case raised questions about how unaccompanied children were being turned away and stranded in Mexico, Vox reported. A September government watchdog report also commented on the practice, called “metering,” in which agents turn away asylum seekers and tell them to return later. This policy, the government acknowledged, could encourage people to try and cross illegally — or between ports of entry — into the United States. As a result, there were already around 1,000 people waiting to request asylum when thousands of Central Americans from the exodus began arriving in Tijuana two weeks ago. Oscar Orellano, from Honduras, told VOSD during the march Sunday that he was considering finding other ways to cross, because requesting asylum didn’t seem possible. Orellano had spent time detained in Mexico and was then deported before making the journey up again with this group in October. This is his third attempt through Mexico toward the United States. Spending months in Tijuana just didn’t seem like an option. 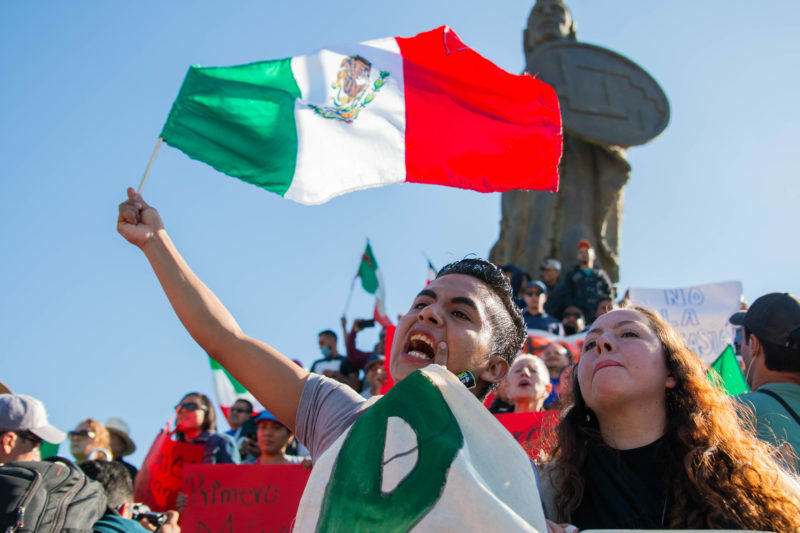 These tensions are also reaching new levels in Mexico, which finds itself between Central America and the United States in ways beyond geography. Since October, both the care and the enforcement of the Central American migrants has fallen on the shoulders of Mexicans. While Mexico has offered much support to the people making the journey to the U.S. border, a conflict between the migrants and Mexican officials at the country’s southern border with Guatemala in October and the unprecedented numbers of Central Americans have unearthed deep-seated conflicts over migrants in Tijuana. Mexican officials deported roughly 11,000 people to Central America between October 19 and last week. Of these, 1,906 were identified as part of the caravan. In Tijuana, the influx of migrants has put a strain on resources, particularly shelter space. The sports facility that was converted into a shelter is now overflowing to the point where tents are set up outside the facility for many to sleep. The city’s mayor, Juan Manuel Gastélum, has asked the United Nations for resources to help with the thousands of resourceless Central Americans stuck in Tijuana and he criticized Mexico’s federal government for not helping. Gastélum has also made comments in Mexican media criticizing the migrants. 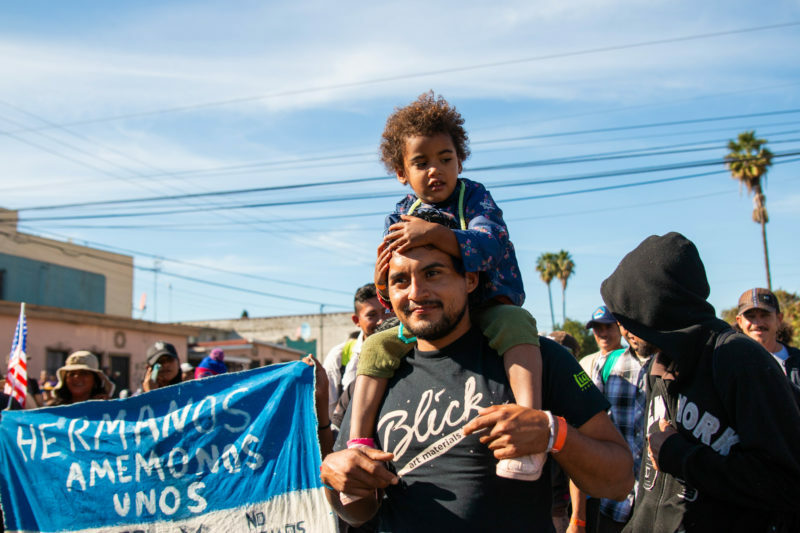 Last Sunday, some Tijuana residents took to the streets to protest the presence of the Central American migrants. Many of the residents also cited videos posted on social media that show migrants threatening violence and criticizing the food that has been offered to them, though the backstory BBC uncovered about the food video gives the comments a different meaning. Buzzfeed looks at how Trump’s nationalist rhetoric has trickled down into Tijuana, stoking anti-migrant sentiments. The San Diego Union-Tribune captures the conflicting, complicated feelings of Tijuana residents that run the gambit of wanting to support the Central Americans and fearing their presence in the city. A Frontera analysis also looks at what is behind the sentiment, which is seemingly new for a city that has long welcomed migrants. 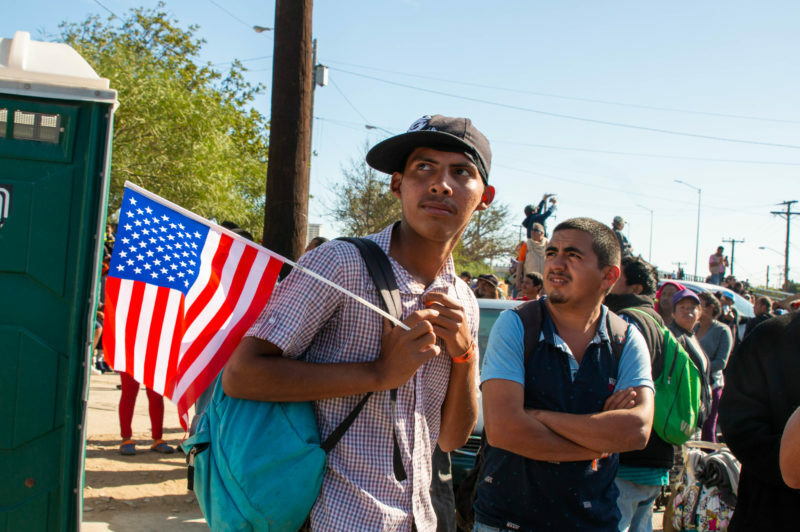 The anti-migrant sentiment among some Tijuanenses and the resource problems, like the poor conditions in the sports facility where migrants are sheltered reported by the Union-Tribune, have all contributed to the tension that’s been building. After Sunday’s events, Tijuana police said they arrested more than three dozen people and are upping security along the border, the Associated Press reports. There are also about 500 Mexican federal police now guarding the sports complex where the migrants are sheltered, the Washington Post reports. The Washington Post reported that the incoming presidential administration in Mexico agreed to a “Remain in Mexico” plan that would require Central Americans to wait in Mexico until their asylum cases played out in court, which can sometimes take years. Mexican officials, however, have since disputed the report. KPBS reports that many mothers within the caravan are worried that the unruly men in their midst are hurting everyone’s chances for asylum in the United States. The Associated Press also compares this group of migrants with the large number of Haitians that arrived in Tijuana years ago and explains why they received a different reception.